"It's about revenge, it's about pain. It's about suffering." Following the LA riots in 1992, Tommy Sowards and Joachim Schroeder followed a group of young 'Bloods' in South Central, and continued to do so for ten years following. The cameras intermittently follow five young men over the course of a decade in a bloody war with the Crips in the "20s" neighborhood. The only commentary is provided by the surviving Bloods themselves, for whom the life has taken its toll, even if there's little remorse, and there are few apologies. There's very little violence, but the film is still difficult to watch. It begs too many questions to be a comfortable experience: is there something darkly special that allows someone to live the gang life, or could any of us wind up there given the same circumstances? Are these young men monsters, or victims? Are they both? In South Central, as a girlfriend puts it early in the film, you die over two colors: "The color of a rag and the color of your skin." There's very little context here, and in this case that's a very good thing. The LA riots serve as a starting point, but for the most part there isn't a great deal of discussion of politics, economics, or race relations. This film is done entirely from the perspective of Bloods on the street at the end of the twentieth century. We see things as they do. At first, that makes it difficult to sympathize. Many films dealing with gangs and the inner city spend a great deal of time explaining, providing background. There's certainly virtue in that, and it makes it easier to empathize, but it also can pull you out of the life stories. Crazy Killer, Dig Dug, K.K., Jumbo, and Low Down don't walk around pondering their socio-economic realities, so it seems appropriate that we don't either. At first I found it hard not to judge: whatever the realities of street life, these are drug dealers, thieves, and murderers. Whatever the necessities of life on the streets, in any other context these young men would be monsters. That's certainly missing the point. For these young (mostly) men (mostly), it is what it is. It's life, the only one they have ever known. What becomes clear quickly is that most have never considered another way of life, that they took the one that was offered them. Until late in the film, when death and age catch up to them and a bit of wisdom seeps in, the thought of stepping away from thug life is either a practical impossibility, or as foreign as is the idea that I would move to South Central and join a gang. Jumbo lives in a tiny house that he shares with three other generations—great-grandmother, grandmother, mother—and six siblings. Stained mattresses rest on the bare floor. There's love in the house, but it's not difficult to understand that life could start to seem cheap in those circumstances. Paradoxically, when one of the young men is killed for reasons that no one really seems to be able to understand, his death haunts the film. None of his friends, fellow Bloods all, seem able to set it aside. Their emotions, even years later, are powerful. For those who visit his grave regularly, there's rage, but also genuine sadness. It's hard if not impossible to reconcile the cavalier and fatalistic attitude toward life that led them into gang life and kept them there year after year with this feeling for a lost friend. It's pointless to try, and Slippin' is right not to. Many a documentary has come up short in trying to find some meaning in it all, some redemptive spirit. While this film may lack the genius of that grand ambition, it succeeds by standing outside, inviting us to find our own meaning, if we can. Image Transfer Review: The quality of the source material varies, but for the most part is surprisingly good. As for the transfer itself, it's quite well done. The image is generally crisp and bright, obviating a contrast between the gorgeous southern California sun and the ugliness on the streets. Audio Transfer Review: The basic stereo track is basic, but effective. It's consistently clear and clean. Extras Review: There's only one extra, but it's a good one. 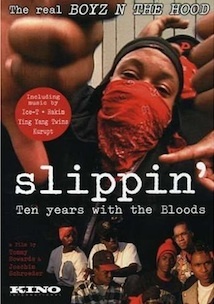 Slippin' Ghettocam is 25 minutes of footage shot by the Bloods themselves in 1993. It offers a slightly different perspective than that offered up by the documentary cameras. No moralizing, no grandstanding, just an insider's perspective on a decade of gang wars in L.A.'s South Central over the course of a decade. Kino has offered up a quality presentation of a straightforward but challenging film.